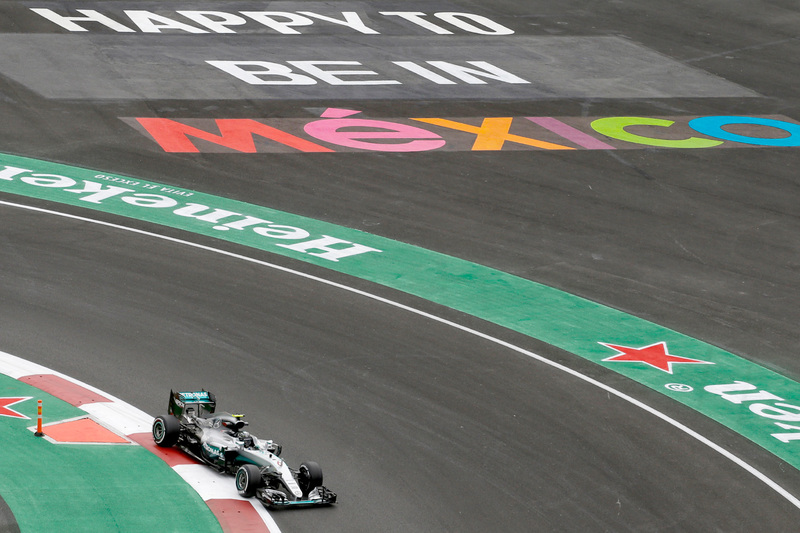 Lewis Hamilton has won an easy Mexican Grand Prix to close his championship deficit to 19 points with two rounds remaining. Hamilton survived a messy start which saw him lock up at the first turn and run wide and teammate Nico Rosberg pushed onto the grass by an aggressive Max Verstappen, but a safety car triggered by Pascal Wehrlein and Marcus Ericsson’s turn-two collision neutralised the drama. The restart after the three-lap caution delivered no surprises, and Hamilton led Rosberg from there until the end of the race, the lead changing only during the single pit stop window between laps 15 and 20. “I’m really grateful the team did a fantastic job to get a one-two here,” he said. Rosberg looked out of sorts for most of the weekend, his front-row qualification earnt by virtue of an unlikely hot lap in the dying moments of qualifying. In this context his second place in the race, only minimally challenged by Red Bull Racing, was expert damage limitation considering a string of second places will be sufficient to guarantee him the championship by the end of the season. The final podium place was one of the few live fights to last the distance of the race, and the battle ignited in the final five laps of the grand prix. Verstappen spent much of the race applying gentle pressure to Rosberg, from third, but Vettel, who made his sole stop 20 laps later than the Dutchman, closed in on the Red Bull Racing car. The Ferrari driver attempted a move at the first turn, but Verstappen locked up and ran wide, holding onto the place. Consensus, including from the Red Bull Racing pit wall, suggested Max ought to have surrendered the position, but the teenager refused to yield. Further complicating matters was that the unfolding battle brought Daniel Ricciardo, who was on the faster soft compound tyre for a rare two-stop strategy, into play, and the Australian duly launched a move on the Vettel. Sebastian, however, appeared to move under braking — a hot topic amongst the drivers and FIA after a number of high profile Verstappen defensive manoeuvres in recent races — forcing Ricciardo into a lock up that almost caused a collision. The trio crossed the line in unchanged order — Verstappen from Vettel and Ricciardo — but the stewards were quick to apply a penalty to Verstappen for defending off the track, adding five seconds to his race time, which demoted him to fifth. The podium ceremony was delayed while race control waited for Vettel to jog from the pit late to take his place on the rostrum after Verstappen was asked to leave the podium green room. “I was using a lot of sign language!” Vettel on the podium, recalling his gesturing to Verstappen as the pair slowed over the finishing line. “You really have to understand the adrenalin was pumping! “I was putting [Verstappen] under pressure. He left the track and didn’t move, so you can understand why I really got annoyed. However, more than three hours after the end of the race the stewards concluded that Vettel’s defence against Ricciardo was illegal according to the FIA’s ruling at the United States Grand Prix that moves in the braking zone would constitute dangerous and erratic driving. Vettel had 10 seconds added to his race time, promoting Ricciardo to third and Verstappen to fourth. The final twist in the battle’s chapter was the prospect of sanctions for his foul-mouthed radio outburst in which he told race director Charlie Whiting to “f**k off” after it became clear Verstappen wasn’t being asked to switch places in the final moments of the race. The German went immediately to Whiting’s office to apologise for his remarks, but with FIA president Jean Todt reportedly watching the race, a charge of bringing the sport into disrepute remains on the cards. Ricciardo was vocally unhappy about initially finishing off the podium, and he voiced his displeasure with Vettel’s defending. “He did what everyone has been complaining about — moving under braking,” Ricciardo said of Vettel’s late-race move. “He’s smiling now, but for me he doesn’t deserve to be on the podium. Verstappen was naturally unhappy to be penalised, and railed against what he believed was arrogance on Vettel’s part. “It’s ridiculous what he did. Daniel was alongside him and he just turned into him,” he said. “Then he is shouting and I don’t know how many times he is using very bad language. “I think he has to go back to school to get some language. Kimi Räikkönen finished an unfortunate sixth after Ferrari put him on a questionable two-stop strategy in what could be construed as an attempt to move the Finn out of Sebastian Vettel’s way. A lap-45 change to used medium tyres took him out of the fight at the front and put him behind Nico Hülkenberg’s Force India, which he managed to overhaul only on lap 66, setting the pair’s finishing position when Hulkenberg spun his car at the height of the pass. Valtteri Bottas and Felipe Massa worked as a block against Sergio Perez in the lower reaches of the points-paying places, the Mexican extremely frustrated behind the Williams cars for the entirety of the race. *Sebastian Vettel was penalised 10 seconds for moving under braking in defence against Daniel Ricciardo.